Will Ambarella's innovation secure it a future seat at the table in the wearables industry? 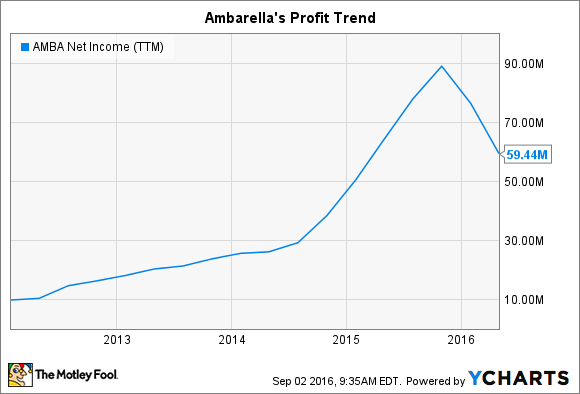 Ambarella (NASDAQ:AMBA) is having a tough year. The camera tech maker's sales are down 20% over the past six months as GoPro (NASDAQ:GPRO), one of its biggest clients, struggled to move its latest wearable devices off retailers' shelves. 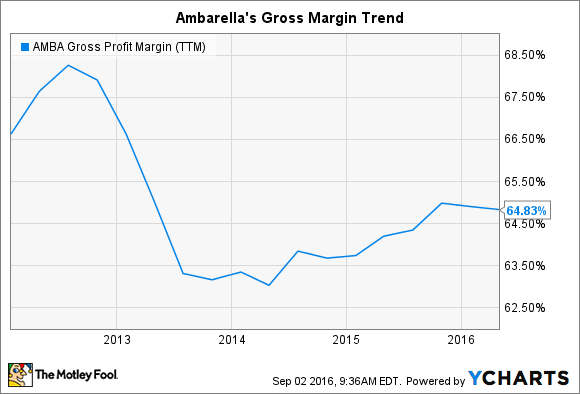 Ambarella has also been dealing with a pesky supply disruption that crimped its production. That expense, plus higher spending on product development, has produced a sharp decline in earnings. Net income for the first six months of the year is down a whopping 75% from the year-ago period to just $10 million..
AMBA Net Income (TTM) data by YCharts. Yet the stock has risen so far this year (up 20% by the beginning of September). Part of that bounce reflects rising optimism that GoPro -- and the wearable sport camera market in general -- will have a banner holiday season. Even more important to Ambarella's long-term growth, though, is its encouraging progress at strengthening and extending its low-power camera tech leadership into new market segments. The company has boosted research and development spending by 30% this year, and until now, the main financial result that investors have seen from that initiative has been a sharply lower net profit margin. However, there are signs that the innovation focus is starting to pay dividends. Ambarella's latest drone camera offerings, for example, boast a mix of features including 4K resolution and electronic image stabilization that low-priced competitors can't match. As a result, the company is gaining market share in the premium high-definition and ultra-high-definition camera segments. The same trend is showing up in the automotive market, where Ambarella's products are moving out of the aftermarket world and becoming integrated dealer-fit options for new cars, especially in the Chinese and European markets. As CEO Fermi Wang told investors this week, the company is enjoying "design win momentum in all our markets." These successes have helped push average selling prices higher despite the drop in overall sales. That's a big reason why the company's gross profit margin was 67% of revenue in the quarter that just closed, up from 65% a year ago and good enough to mark a three-year high. AMBA Gross Profit Margin (TTM) data by YCharts. There's a lot that can still go wrong for Ambarella across all of the fast-evolving markets it competes in. Yes, GoPro in late July said that it is seeing "clear indications of strong consumer demand" ahead of major product introductions, the Hero 5 and Karma drone. A rebound in the wearables industry could quickly turn sales higher for Ambarella. Yet there's no guarantee shoppers will race back into these high-end tech segments. Meanwhile, low-cost competition continues to snip right at Ambarella's heels, especially in the critical Chinese market. The company lost share last quarter in the professional security niche in China, for example, to value-focused rivals. That's an important reminder that it can be displaced from below even as it gains market share in the more premium niches. However, it's undeniably good news for the business that the company's design, tech, and pricing leadership is extending away from the wearable sport segment into potentially huge growth areas like drones and automotive sensors. For Ambarella to earn its premium valuation, it will have to continue to push the bar higher on innovative standards across these market segments.